A Novena is a very special time of reflection. Every year, our MSC family joins together in prayer for the Novena in honour of the Sacred Heart. Mass is celebrated daily at the Sacred Heart Church in Cork during the Novena, as we draw strength and hope from the Sacred Heart of Jesus. Each day during the Novena, we remember in a special way all those enrolled in the Golden Book of the Sacred Heart. A copy of the Golden Book is displayed on the altar at our daily Novena Masses, along with the prayers and intentions received from our mission friends. On each of these nine days, the Word of God is spoken, with something unique to say to each one of us. This may be a word of hope, a word of reassurance, or perhaps even a word of challenge, calling us to a deeper relationship with God and with those around us. Together, we follow the daily readings, trusting that we will find inspiration, encouragement, and motivation through the presence and power of the Sacred Heart. All are welcome to join us in a blessed and prayerful Novena, and to submit personal prayers and intentions for remembrance. We would greatly appreciate your support for our ongoing mission projects, and in gratitude for your contribution, we will be glad to remember your intentions at our daily Novena Masses. You can then submit your personal prayers and intentions online, and our MSC priests will remember your petitions specially during our Novena to the Sacred Heart. Mission friends from all over the world can share in the Novena to the Sacred Heart by watching our daily Masses live here on our website. The Novena to the Sacred Heart takes place annually, prior to the Feast of the Sacred Heart, in the Sacred Heart Church on the Western Road, Cork. Masses take place daily at 10.00am and 8.00pm. I kneel at your feet. whose heart is the source of all blessings. Share your petitions silently with the Sacred Heart. You are the God of mercies and you will not refuse a contrite heart. will find in my weakness a motive for granting my request. 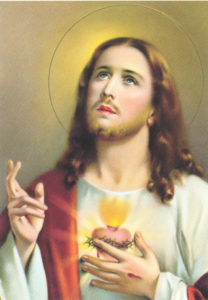 Most Sacred Heart of Jesus, have mercy on me.